John Key’s rationale for refusing to throw the state’s resources behind the call (recently made by new Children’s Commissioner Andrew Becroft) to reduce child poverty by 10 percent, would have to be the lamest excuse since “The dog ate my homework.” According to Key, it is too hard to measure child poverty. Far harder to measure the number of poor children than the number of predatory pests, Key argued yesterday. Leave aside for a moment the mentality by which poor children and pesky rodents somehow end up in the same policy response frame. Even if it was insuperably difficult to agree on a working measure for child poverty – and it isn’t – should that stop Key from joining a campaign to tackle its causes, and then worry about the measurement methodology afterwards ? Of course it doesn’t. These results and the targets that agencies have set for them, present a challenge – it won’t be easy. Our public sector will need to find and create opportunities for new ways of working together to achieve the results and deliver better public services. It’s what New Zealanders have told the Government they want, and deserve it. In time, this work will demonstrate innovation and improvement across a public sector that is connected and collaborative. Ministers and a public sector chief executive have been made responsible for the achievement of specific results, and for publicly reporting on progress. To start with, it should extend the 10 targets under its Better Public Services initiative to include child-poverty reduction goals and enunciate a strategy to achieve these goals. Explicit targets provide a powerful signalling and commitment device. They clarify policy direction, harness the energies of government agencies, and enhance political accountability. Any targets should be ambitious but credible. Realistically, child poverty cannot be eliminated. But New Zealand could undoubtedly secure rates of child poverty and material hardship that are amongst the lowest in the world. We achieved these outcomes for retirees several decades ago. Our children deserve nothing less. Next, the strategy should be evidence-based and informed by sound ethical principles. 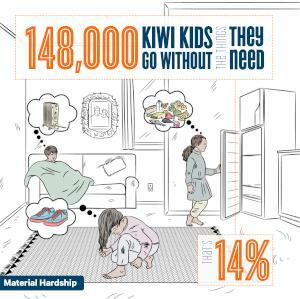 There is no lack of good evidence on the nature, scope and scale of child poverty in New Zealand or about why different kinds of families are poor. Equally, there is substantial international evidence about how to reduce child poverty in cost-effective ways. New data shows about 2000 children on any one day are living in households where their parents have lost up to half their benefits because in most cases they have failed to turn up to an appointment. Beneficiary advocates and researchers say the Government is being negligent towards these children by failing to track what’s happening to them. So you have to ask …why is the Key government being so gun-shy when it comes to joining a multi-party, community driven response to child poverty? Answer: (a) because it fears it would lose control of the exercise, and (b) because it would become evident that some of its own policies are feeding the problem. It really is that simple. Measurement over morality, politics over principle, every time. The prospects for the Trans-Pacific Partnership trade agreement coming up for a vote in Congress before the end of the year seem to dwindle as each day passes. Senate Majority Leader Mitch McConnell told reporters Thursday that the political environment surrounding trade has become too “politically toxic” to bring up the 12-country agreement during the lame-duck session after November elections. “I believe if it were brought up this year it would be defeated anyway,” said the Kentucky Republican, who generally supports trade agreement such as the TPP. McConnell added that holding a vote that is unlikely to succeed would injure future deals. “Leading you to raise the obvious question: If you’re interested in America being in the trading business in the future, in what way is it advantageous to have a trade agreement go down? I would hope that whoever’s elected president — we can get back into having a serious discussion about the benefits to America of being in the trading business,” he added. And Paul Ryan? He’s been against a lame duck vote on the TPP since August. Ryan has also voiced skepticism on the TPP’s prospects, despite his personal support for trade. Some Republican lawmakers typically inclined to support trade deals have objected to some provisions in the TPP that could hurt tobacco and pharmaceutical companies. Now, the die-hard TPP believers might think that McConnell and Ryan are just foxing pre-election, in order to shore up Republican candidates who would otherwise get offside with voters who oppose free trade. In this scenario, the Republicans will revert to support the TPP once the shadow of the election has passed and will be more than happy to hand the Democrats an early Congressional victory – such being the Republicans’ alleged passion for free trade. John Key aside, there are few other subscribers to this unlikely theory. The interesting thing on this score is that Clinton supporters seem to be more positive towards free trade agreements than the current crop of Republican voters. Currently, 45% of voters say free trade agreements have been a good thing for the United States, while about as many (47%) say they have been a bad thing. As Coltrane moved into his own in the mid 1960s… here’s a terrific version of “Impressions ” with quartet stalwarts McCoy Tyner on piano, Jimmy Garrison on bass and the great Elvin Jones on drums. I have often called jkey a puppet of Wall Street, Washington, and Hollywood. Okay, Crosby Textor pulls the strings, instructions come from uncle sam. This mornings interview with Espinor was a classic case of spin not answering questions. Even Espinor ( a Tory shill) sounded exasperated. How is it so hard to measure child poverty? Probably because blingish and his treasury cohort still do not want to spend money on social issues. Money is better spent on trucking. Damn! I forgot to say a huge thank you for the Coltrane clips. Loved them. DAMN! Forgot to thank you for the Coltrane trax. Loved them. Children are not separate from their parents, parents that the govt have hit hard with the ” austerity ” measures. The Crown NZ Govt creates poverty and keeps people in poverty in many cases. The corporations and companies that it owns exploits and underpays its workers and overpays ministers, CFO’s, MP’s, CEO’s ,politicians, Crown solicitors and its Judges. Yip the spin is in. There is no such thing as “Child poverty” as it is “Parental poverty” , poverty which is all imposed by the govt’s economy, inc social welfare cuts, unlawful MSD policies and the corporations min wage. A Hypey ” living wage” which is just the min wage inflation adjusted by local govt to make themselves look progressive and create more debt for their privatization scheme . Meanwhile the ministers and other govt crooks that are talking about buzz words CHILD obesity/poverty/equality continue make out like bandits. That’s a more plausible excuse, really. And people elect this fellow and his party? Good grief…. There could be a such multi-party study as the growth in inequality has been a main stream global phenomenon for four decades. When Labour brought in Roger Douglas in 1984 they joined that path. It has become so much a part of politics in NZ, under Labour’s lead really, that profound global solutions can’t even be talked about and Labour is not likely to provide any real alternative discussion. The Greens at least could, but will not want to rock the boat. National should be able to manipulate such a multi-party group to their medium term political advantage.